Based on our VariSam automation platform we designed a new Automation for Oilseed Measurements: AOM. The new AOM automation has two modes for research and for fully automated measurement. The VariSam autosampler is equiped with a NMR spectrometer, a balance with a resolution of 0.1 mg and two sensor detected sample racks for up to 500 samples. 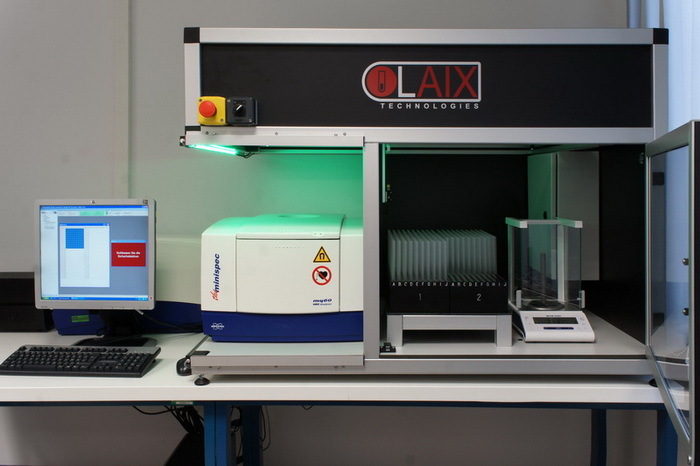 The sample and balance arae is secured by a safety door, the spectrometer is free for manual measurements and protected by light curtains. The system runs with a speed of 700 mm/sec and the fastest electrical gripper on the market. The Windows XP/Vista/7 based software has an up-to-date and user-friendly interface allowing you to run many different methods. You can start or stop samples, place or take out sample racks and switch between the two modes at any time. 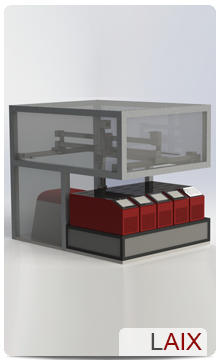 Our SFC automation is an open system that is not bound to a specific spectrometer. We can implement your equipment or we can offer you a new system of your choice. The system that we standardly support is theBruker Minispec. Like most of our products, AOM automation is designed as a modular system. This allows us to take your methods and a sample throughput as a basis for creating a system that exactly meets your needs.